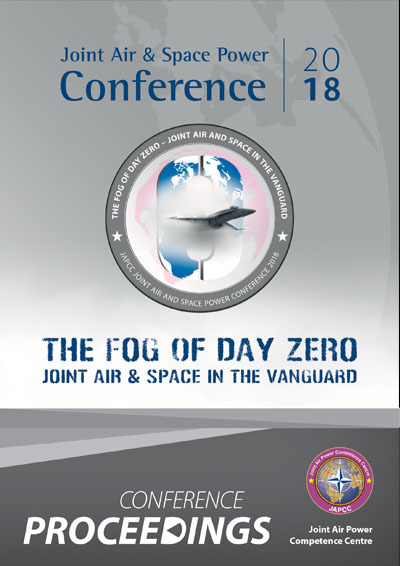 Only through in-depth and focused examination can we begin to try and disperse the Fog of Day Zero and assess where Air and Space Power contribute to the solution. From the panel discussions we can conclude that, as ready as NATO is, there is still work to be done. NATO must focus on three areas: defining threats and attacks, increasing NATO’s operational readiness, and protecting forces to enable an appropriate response. NATO must better define effects, conditions and criteria that enable malicious non-kinetic activities to be classified as an armed attack and be able to ­respond using all the instruments of power, at a time and place of its choosing. NATO must continue to devise ways to ensure that Day Zero does not become Day One, or if deterrence fails, be ready to act on Day One with an adequate and proportional response. An appropriate level of readiness is more achievable when we conduct more realistic exercises. The exercises must address challenges, such as operating in a degraded environment, relying less on centralized C2 and on defending NATO assets and territory from both peer competitors and VEOs, and everything in between. NATO must reassess its Force protection posture, the hardening of facilities and dispersal of assets and capabilities for greater survivability and resilience. Additionally, NATO must also develop methods of providing cybersecurity to ensure networks, networking and networked assets are survivable and redundant. Finally NATO must improve, as well as shorten, logistical tails and acquisition timelines by leveraging our industry partners and embracing technology. The advantage NATO forces previously enjoyed over near-peer competitors is no longer as wide as it once was. NATO’s ability to respond quickly to, and be successful in, an Article 5 confrontation that could start one second from now is better than it’s ever been before, but it’s just not fast enough. NATO must strive to regain the capability advantage and reduce response times to prevent the significant losses that could occur in a campaign by failing to recognize that hostile activity is underway. NATO must continue to improve how it conducts joint operations, including embracing new domains (such as cyber and space) as they mature. NATO must also adapt to a threat that is not unidirectional, as in the Cold War, but rather multi-dimensional. The current threats facing NATO come from outside and within the Alliance’s borders, from space and cyberspace and target areas ranging from traditional military strongholds to critical infrastructure and soft targets in our homelands. Cyberspace has been recognized by the Alliance as a warfighting domain; it is time for Space to be as well. Modern adversaries particularly peer and near-peer competitors, are building Space and Counter-space capabilities, so Space will become a warfighting domain whether NATO wants to acknowledge it or not; the longer we wait to do so, the farther behind we will be in defending the broad set of capabilities upon which we have become inextricably dependent. After decades of counter-terrorism and small-wars, NATO must execute a paradigm shift. The enemy might not attack ‘force on force’, or even kinetically at all. Attacks are more likely to take place in the information domain, against the financial sector or on any of a number of critical services or combinations thereof. An effective response from NATO will depend on early recognition and rapid countermeasures to defeat them before they cause irreparable damage or the death of Alliance citizens, or weaken NATO against armed confrontation. The ability to execute detection, prevention and defensive counter-action will depend more than ever on the cohesion of the North Atlantic Council and the delegation of appropriate authorities to SACEUR. This may require some high-level discussions in Brussels about the interpretation of the Washington Treaty Articles in light of new technologies and threat vectors, and our Alliance would be well-served if those discussions began sooner rather than later.